...which is a fun play on words, but most misleading and sets the scene for the rest. The article is a PR blurb for the "9th International Heartland Conference, Las Vegas". As with the various "World Cups" in the USA, the "international" in the title is misplaced. In this case it just means that the people who finance the Heartland Institute also pay for various like-minded disinformation lobbyists in other countries. Neither the American heartland nor the Heartland Institute itself is international - they are both very much a creature of the United States of America. So the article leads in with an error. Is that the error Christopher means to "end"? No. It is now evident to every honest scientist that the official estimates of climate sensitivity on the basis of which governments are squandering trillions are exaggerations. Yet governments – particularly on the hard Left – are doubling down on robbing taxpayers and regulating out of existence their political opponents’ principal funders, the fossil-fuel corporations. I've treated it as a complex error because it is wrong from a logical perspective, a scientific perspective, a political perspective and a denialist perspective. From the logical perspective, Christopher's use of the phrase "every honest scientist" is merely a rhetorical trick (and a lie in the context he's used it). From the political perspective Christopher is wrong too. Few governments would survive if they were "doubling down on robbing taxpayers". (Some do.) Governments of the 196 member nations of the IPCC have an aim of shifting away from fossil fuels and reducing CO2 emissions, wherever they are on the political spectrum - whether on hard left (Vietnam? ), the left-centre (eg the previous governments of Australia and New Zealand), the centre (eg current USA executive) or on the right (eg Australia, the UK, New Zealand) or a mix of left and right (eg Germany). From the denialist perspective Christopher made an error because he implicitly tied fossil fuels to climate sensitivity, which many deniers like to deny. Christopher's next error is again from logical perspective, the political perspective and the scientific perspective, although implicit in this paragraph is a correct interpretation of the science (which Christopher now denies). This error gives a clue as to where deniers are now heading - "if the science is right, then the science is wrong". The only escape from the humiliation that Leftist governments and their cronies in academe, the scientific community, and the news media will otherwise inevitably face is to bully and cajole non-Left governments into collective action to cut CO2 concentrations worldwide. Then, when global temperature fails to rise as they now know it will fail to rise, they will claim that their CO2 reductions Saved The Planet, when the Planet was not at risk in the first place. It is a simple but wicked strategy, which will never be described, still less challenged, in the Marxstream news media. His argument is that if CO2 is cut and temperatures stop rising (or stop rising at the current rapid rate), that will prove nothing. In other words, Christopher is now denying that there is a greenhouse effect. It used to be that deniers would argue that if CO2 emissions were cut then temperatures would fall, according to their misunderstanding of science. That is wrong. As long as CO2 is increasing in the atmosphere, then energy and heat will build up on earth - heating the oceans, land and air and melting ice. It's not until atmospheric CO2 starts to fall that the earth will start to cool again. Regardless of what we manage this century, it's not likely that global surface temperatures will get back to pre-industrial levels for many millenia. Christopher's next error is that he claims that at next year's UN negotiations in Paris next year, nations will be attempting to agree a "binding climate treaty in all material respects indistinguishable from that which was defeated at Copenhagen". That's not quite right. The aim will be to go beyond what was attempted at Copenhagen. What happened at Copenhagen was that there was that there was no global agreement on binding emission reduction targets, although progress was made in getting the world to act on global warming. ...stressed that the summit on climate change that he is convening at UN Headquarters in New York in September will be an opportunity for global leaders from Government, business, finance, and civil society to initiate ambitious joint actions on the ground to reduce emissions and strengthen climate resilience, mobilizing the political will for a meaningful global legal climate accord by 2015, when States parties to the UN Framework Convention on Climate Change (UNFCCC) will meet in Paris. The pro-global warming lobby have set their sights on Paris because that's the one where nations are hoping to agree an international accord. Also, if there's no agreement in Paris then it'll be up to the whim of elected governments as to what happens. 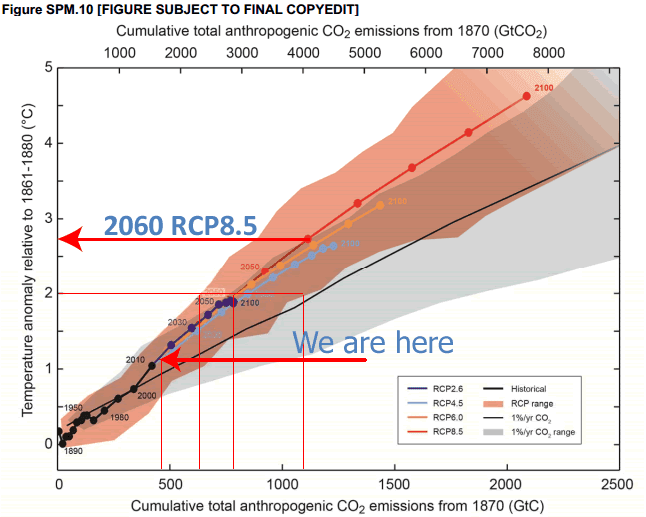 Any agreement in 2015 will probably not make much of a difference until at least the 2020s. Yet this is the Critical Decade. After that we'll be battling significant climate change and all that goes with it. Global warming advocates, like Christopher and the Heartland Institute, know that if they are to prevail in their weird quest to get the world as hot as possible as quickly as possible, then they have to prevent any international agreement or the world may be able to reduce the speed of climate change. That doesn't suit their agenda. Thing is of course that most of the businesses on whose behalf some of the disinformers have been acting, would have been planning for a reduction in fossil fuel use for quite some time. Soon the only people dragging their feet (and knuckles) will be the extreme right wing fanatics like Christopher Monckton, who are so "small government" they verge on being anarchists. At one level, the very existence of Las Vegas – not just a gambling joint but the whole hog – is a paradigm of what we are up against in the climate debate – the exploitation by the well-organized few of the insufficiently educated many. Notice how he slips in a ludicrous claim that the thousands of climate scientists and earth system scientists are instead merely a "well-organised few" and how he heaps scorn on the majority of the general public as "insufficiently educated". Projection - much. Christopher then muddles through several more irrelevant paragraphs on gambling before his "See you in Vegas" closing sentence. Thing is, what Christopher and other professional disinformers want Americans (and the rest of the world) to do is bet against overwhelming odds. He's placing his bet on the less than 0.0000000000001% chance that 21st century climate science, physics, chemistry and biology are all fundamentally wrong. He wants the "fossil fuel corporations" he's defending, to continue to toss all their waste products into our fragile atmosphere. He's wanting people to bet that CO2 isn't a greenhouse gas after all and that more of it won't change the climate. He's wanting people to bet, against all odds, that science of the past two hundred years or more is wrong. It's either that or he is, as I said earlier, a global warming advocate. What he wants is for the world to get as hot as possible as quickly as possible. Maybe, like wartime racketeers, he sees opportunities to exploit tragedy. This is where we're heading if gambling disinformers like Christopher Monckton continue to have their way. This kind of paranoid, paradigmatic thinking is no better than the Left insisting that skeptics are all in the pay of big oil. Plays well with the WUWT readership, but is that your only goal? There’s no good reason to think that Obama for example, isn’t wholly convinced that he’s on the side of the angels. Of course he’s appallingly ignorant, but that’s a far cry from the knowing cynicism you’re suggesting. They picked a very BAD time of the year to have a conference in Vegas – depending on which weather report one looks at, we’ll be between about 104 to 108 within the next few days – and by July, there’s no telling what the temps will be – wouldn’t be all that unusual for it to be over 110, or even 115 – with nighttime lows sometimes still around 100. But hey, at least it’s a dry heat! Perhaps Chicago in mid-winter would have been a better choice? The re-assignment of a classic anti-capitalist icon to the eNGO leadership ought to particularly gall the eco-pious. Even among Anthony's usual crowd of circus performers, he stands out as a particularly egregious buffoon. He is such an easy target for ridicule, one would think there would be some protest, however feeble, at even allowing him to show his face in the sacred environs of WUWT. There are also a couple of "socialists" at WUWT, like the irreverent Rev Richard S Courtney, who protests from time to time at the way WUWT-ers paint all "leftists" as not being part of the denialati, when clearly some of them are. Richard used to work in the coal industry. Maybe he was a unionist. Not sure. But I do know he opposed Maggie Thatcher's "war on coal". “Koch and ExxonMobil have recently pulled back from publicly visible funding. From 2003 to 2007, the Koch Affiliated Foundations and the ExxonMobil Foundation were heavily involved in funding climate-change denial organizations. But since 2008, they are no longer making publicly traceable contributions. Most funding for denial efforts is untraceable. Despite extensive data compilation and analyses, only a fraction of the hundreds of millions in contributions to climate change denying organizations can be specifically accounted for from public records. Approximately 75% of the income of these organizations comes from unidentifiable sources." My understanding of what an "international conference" means is that people are showing up from different countries -- this is as opposed to a conference that's only meant to be for locals. If Monckton shows up to the Heartland Conference, it can rightfully call itself international. My other understanding is that there are only two reasons to put "international" in your title: first, if it's a joint thing between national agencies (e.g. ISAIRAS, organized by various space agencies). Second, if it's a podunk conference that wants to sound more impressive than it really is.